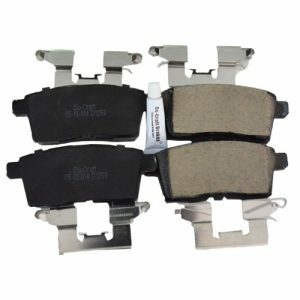 Du-Craft Premium Ceramic brake pad is a perfect OEM alternative that guarantees retains or restores the optimal stopping power that came with your vehicle from the factory. Its copper-free ceramic friction formula(of North American Standard) offers excellent stopping power and great stability while protecting your rotor(disc) surface from excessive wear that shortens its service life. Enjoy up to 30,000kilometers of smooth, stable and quiet braking, and a product warranty for 10,000kilometers or 6months,whichever comes first(Terms and conditions apply). This D1258 set is an exact fit for the 2007-2016 Ford Edge.